That’s how Thais describe their country’s sights. Somehow it’s all alike… and yet there’s a certain distinction. Today, this phrase became a running gag among tourists and jumps into your face from every corner; t-shirts and posters and beach towels and whole buses painted with it. While the first hippie self-discovery trips to Thailand took place about 50 years ago, it today is the international version of the German 17th Bundesland Mallorca. A hip destination of choice for hormone-driven party animals, more or less experienced backpackers and snap-addicted globetrotters. Some on the search for freedom, others searching themselves. I experienced a few quite yes, I’d say authentic, diverse insights into the country during my four weeks. Here, I’m gonna talk about my stay in the North. Actually, people seem to be even more relaxed and hospitable compared to the South. That may be due to the less heavy tourism, even hotspots like Chiang Mai are way more laid-back than the tourist Mecca around Ko Phangan. Regarding the highly praised Thai kitchen, it here is rather on its peak offering dishes that you often can’t get anywhere else, like Khao Soi for example. Consider the rich landscape: mountains covered in thick jungle, narrow paths with serpentines that make every biker’s heart beat faster, idyllic lakes and rivers as lifelines and dangers during floodings at the same time, thundering waterfalls with natural slides. You simply can’t get a thorough impression of Thailand without having been to the North. This is a 600 km route with around 2000 hairpin curves, making for a 4 to 5 day road trip, winding its way through the ravishingly beautiful, wild, mountainous province of Mae Hong Son in northwest Thailand. Quite popular among motorcycle enthusiasts, it makes for an adventurous route a little off the beaten paths of Southern Thailand. I haven’t done the whole loop but covered the distance between Chiang Mai and Mae Hong Son in several trips – by bus. Never rode a scooter before. And wasn’t too sorry to not have done it when seeing all the accidents along the way. So, safety first, and saving the experience for next time. And still – the route was absolutely gorgeous! 26 freaking hours. From Hamburg (Germany) via Amsterdam (Netherlands) via Guangzhou (China) via Bangkok (Thailand) to Chiang Mai (Northern Thailand). Don’t ask why. Cheap. I arrived exhausted but eager for a new adventure ahead. My flight was delayed, and still my couchsurfing host Nui picked me up at the airport and led me to a nearby fantastic restaurant. It was rather empty, we could gaze at the night sky, and a life band was playing. His girlfriend already awaited us. At a table almost collapsing under a gigantic Thai buffet. Just for the three of us. I was STUNNED. After the plain plane dishes (*grin*) and a thin soup at the Chinese airport, I was seventh heaven. 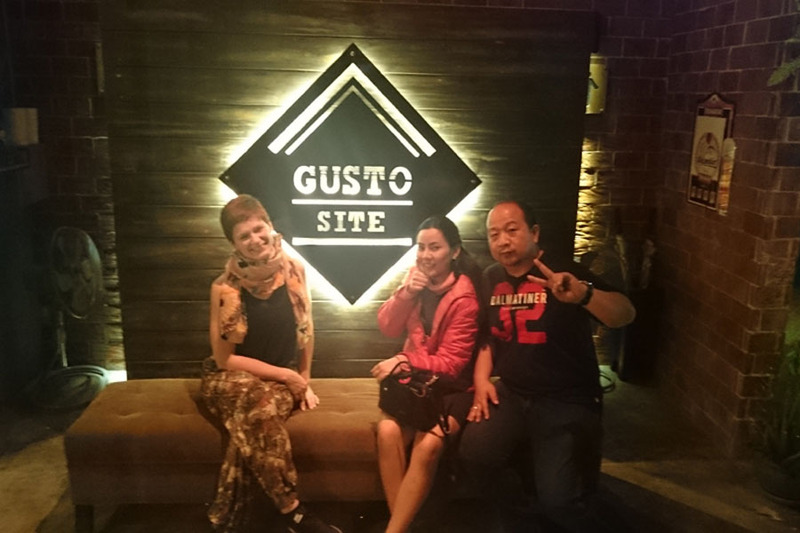 We had a stimulating conversation about our cultures, about why they participated in couchsurfing and why I traveled alone as a woman, about Thailand in general and its economy. Since Noona then felt cold… nah, they didn’t go home to get her a jacket, we went to the next story and bought her one. And him as well. And they bought me a shirt. To remember them every time I wear it. WTF? I was speechless but couldn’t help to gratefully accept (I had only one other shirt with me). Correctly guessing about the degree of my tiredness, we then drove home through the city (so I could have a half-conscious glimpse on the buzzing night markets) to their home, 15 minutes by car from city centre. The couple didn’t live in one, but two houses (since once was not completely renovated yet) – and they let me stay in one. By myself. A fully furnitured two story house; a living room with a complete full HD Dolby Surround TV set, a kitchen with a filled fridge, two bathrooms, two bedrooms and a praying / meditation room. I fell into bed (after having been welcomed by my new pet, a cute little lizard disappearing behind the cupboard). And was picked up the next morning with fresh breakfast and a lift to the city. Chiang Mai means “new city” and yet dates back to as far as 1296, when King Mengrai founded the city to move the capital from Chiang Rai, which was difficult to defend from the near enemies. Surrounded by picturesque mountain villages, it’s located at the southwestern Himalayan tongues and north of the central Thai lowlands, right at Ping River. 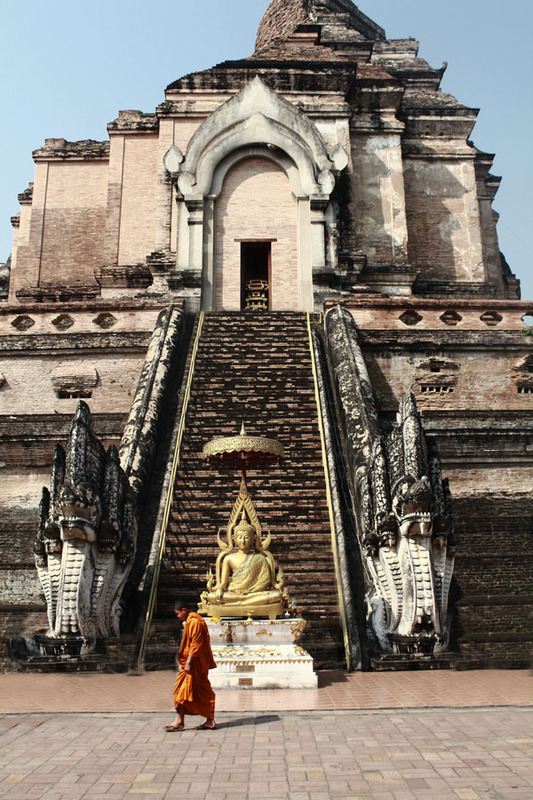 Today, over 200 temples dominate the image of Chiang Mai, and it’s become the perfect destination for any adventurer. I explored the city simply by starting to walk around. I chatted with other travelers I met on the streets, I visited the temples that I passed by (make sure you always carry a scarf / skirt / anything to cover shoulders and knees), tried fresh coconut that were sold from a small truck at the side of the street, and had my first Pad Thai of many to come. Over facebook I had gotten in touch with another backpacker and we met up for lunch, while I was eagerly gathering tips for my trip to Pai the next day. And serious information about a whole life abroad after having sold everything back home. But that’s a different story. Chat with monks: DEFINITELY do that! It’s an amazing experience and a unique way to look behind the scenes of a monk’s life, to understand the life they live, the decisions they made. okay, this is probably the most famous thing of all, but still I want to encourage you visiting it despite the rather discouraging masses of tourist: Doi Suthep, a pompous temple overlooking the city and its marvelous surrounding. 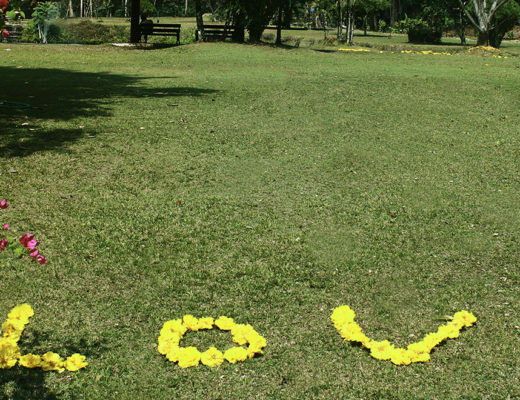 chill in Chiang Mai Park to escape the hustle and bustle of the city. Many locals actually come here as well for running, working out or simply relaxing. You can rent a mat for 20 Baht to lay down on the grass and just observe. There are plenty of opportunities for snacks and drinks like iced coffee and papaya salad. elephant trekking is something I missed due to the lack of time but, if you’re interested, I would highly recommend to do around Chiang Mai. After intense research when I was in the South of Thailand later, it appeared up north were the only really trustable companies treating the animals with respect – please inform yourself before! This one has repeatedly been considered an ethically good choice. while I’m at it, a little research can’t harm if you plan to visit the hilltribes. Tourism and capitalism doesn’t just do them good, even if the insights into their traditions and rites seem highly authentic at first sight. Either way, try to get in touch with locals. Especially up here I encountered many helpful Thais, eager to show me around and explain their culture to me. Like, coming back to it, my hosts. To cut it short, they invited me for another gorgeous dinner, and when I wanted to leave to hitchhike to Pai the next morning, they refused to let me go, drove me to the bus station, bought me a ticket (that for locals is way less than tourists, however that makes sense to me), and there I went. The first couple of kilometres are a highway – or that what comes closest to a highway in Thailand. Soon, we left the city of Chiang Mai and started to cruise through the mountains and stunning landscapes with diverse vegetation, depending on altitude. At first it reminded me a little of driving through Tirol, Austria. But soon, the mixture of excitement and amazement was replaced. Oh dear, that drive ain’t pretty. Severe descents, spiraling through the mountains, long winding curves and screwy hairpin-turns, letting the faces of travelers slowly turn green. Also the change in altitude had an impact on my ears like I never experienced it before, and I ended up with having pressure problems for almost two weeks (worsened by a heavy cold I got later). At the short stop we made, locals were selling food and wares, while their children ran around in traditional clothes to make photos with tourists. When arriving, I went straight searching the hostel my friend from Chiang Mai recommended me – of course I set off in exactly the wrong direction and arrived an hour later, but still happy. Common Grounds was supposed to be the place to be – and indeed, I didn’t feel like a visitor, but like part of a little family with always arriving and leaving members. 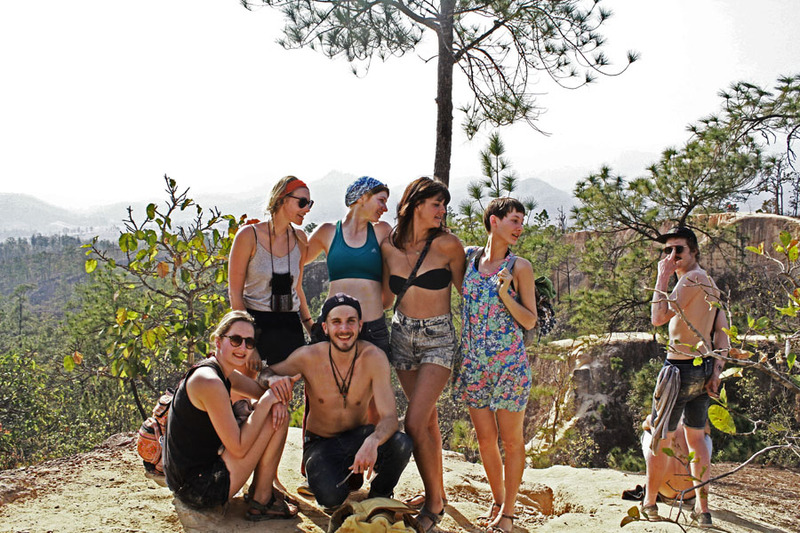 But Pai, this so controversial, in a way romantic, little hippie nest, will make for its own post (to be written soon). To me happened though, what happened to everyone I talked to: Instead of the planned 2 nights I had a relaxed and yet adventurous stay of more than a week. Shortly after Pai we passed the Mo Paeng Waterfall where backpackers where sunbathing on the stones. 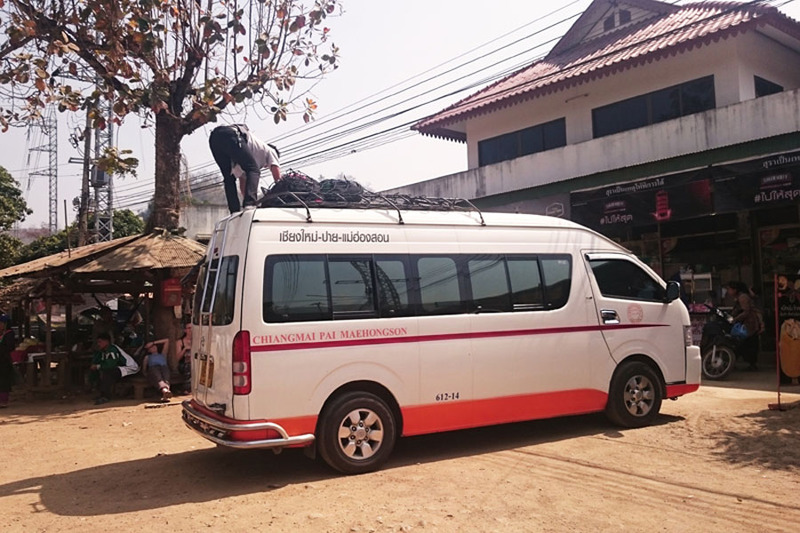 It were about 100 km to the city of Mae Hong Son, that, however, take longer than expected. The slalom journey of countless corkscrew bends through the rich nature continued, allowing wide views over the valleys below. Every climb was followed by an equally steep descent, roads that seemed to simply drop away before your eyes. 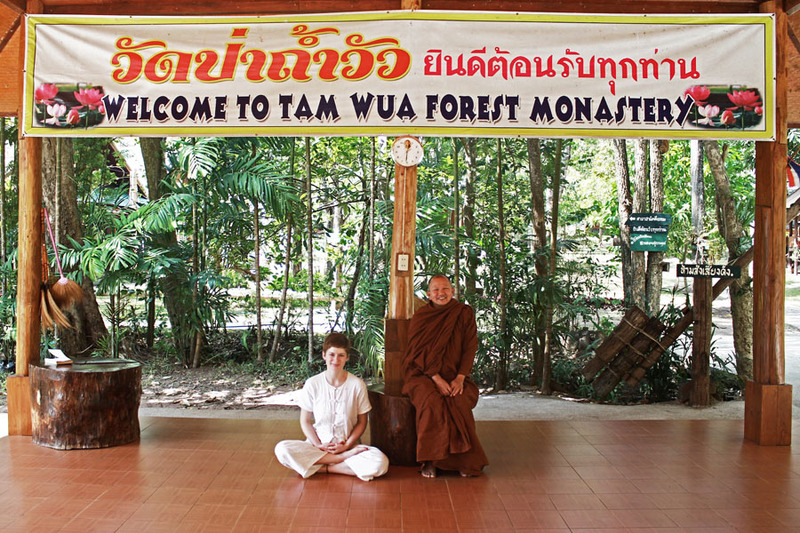 I made another stop about halfway at Wat Tam Wua Forest Monastery – a little community in the middle of nowhere, in the most peaceful and quiet place you can imagine. I stayed there for three days, living with the monks, participating in group meditation and mutual exchange with other travelers settling to practise mindfulness. Some stayed only a couple of days, other weeks and even months. You can read about my experience here – that I honestly recommend anybody to try at least once. I covered the rest of the distance by hitchhiking without any problem, and waiting just 5 minutes. Picked up by another very sweet Thai couple, we had a nice chat and they drove me around the town for quick orientation to then drop me off at the cheapest nicest place they could find (always a huge plus to have someone speaking Thai with you). The city’s nickname originates from the mist it is surrounded by in all three seasons: the wafting smoke of the summer’s forest fires, the dewy fog in winter, and the rainy mist during – guess what – rain season. I did enjoy my time in Chiang Mai and Pai, however I was grateful for the piece and quiet I found at the monastery and wanted to contemplate a little longer. Mae Hong Son, a total of 924 km north of Bangkok, was just the perfect place for that. I wandered the streets and explored the temple at the lake, I strolled the few shops and tried exotic and hell, absolutely delicious snacks at the night market. One of the best things in general are the fresh fruit that, once tasted, will make you frown upon any no matter how bright banana or soft mango you come along in Europe. Honestly, they don’t deserve those names. Asian fruits were a sheer enlightenment, best bought right from those small fruit stands at the roadside. 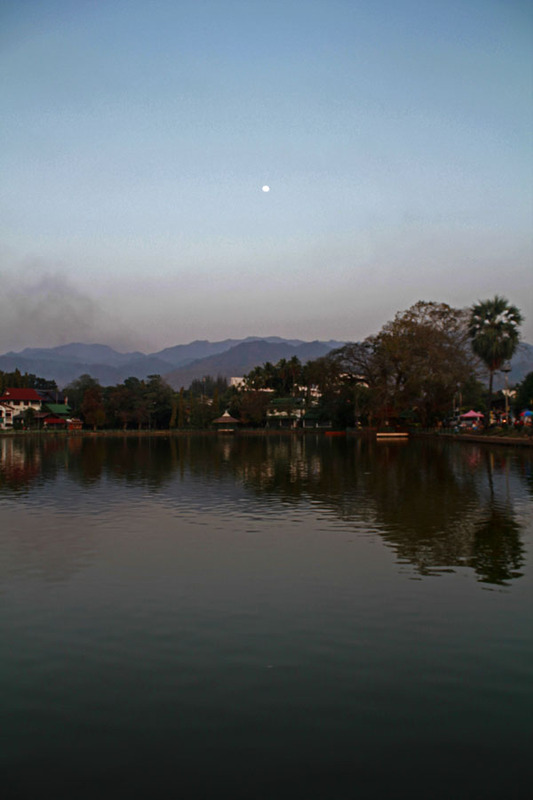 In fact, the town is barely larger than Pai, however Mae Hong Son is far less flooded by foreign visitors. It does have a rather laid back and peaceful touch to it than its buzzing neighbor down the road. for me, Wat Chong Kham, one of the lakeside temples originally built in 1827, was a great get away and place for some contemplation, with only a few monks walking around. 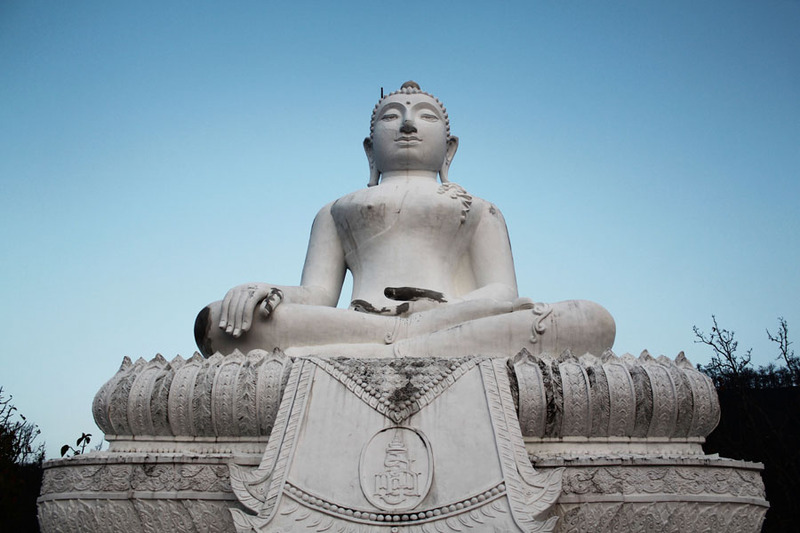 It also houses a huge Burmese-style Buddha statue. 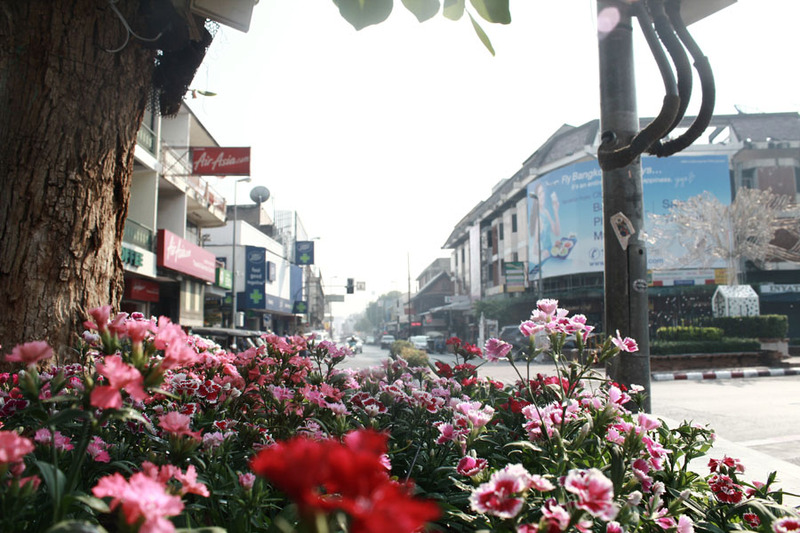 Being the Northern end of the Thai railway system, Chiang Mai is a good base to start exploring the area. Busses as well as national flights connect the city to the most important destinations in the north. The Chang Pheuak Bus Terminal serves for regional transport, while the New (“Arcade”) Terminal offers long distance busses to bigger cities and also Bangkok. The Asia Highway serves as a direct connection to the about 700 km further south capital. There’s no need to book in advance if you don’t mind walking around. Even in high season, there’ll always be a place to stay for cheap (compared to way higher rates in the South). If you, like me in Pai, have a specific place in mind, you should consider reserving a bed though. Something easily forgotten but very important are public holidays, like Chinese New Year, Makha Bucha (an important Buddhist festival celebrating the spontaneous gathering of 1250 monks to honor the Buddha around 2500 years ago) and Songkran (Thai New Year). This can lead to canceled or fully booked transport, increased prices and more difficulty to find a place to stay. Oh, and you could come by huge cheering crowds that try to soak you to the skin with water pistols. 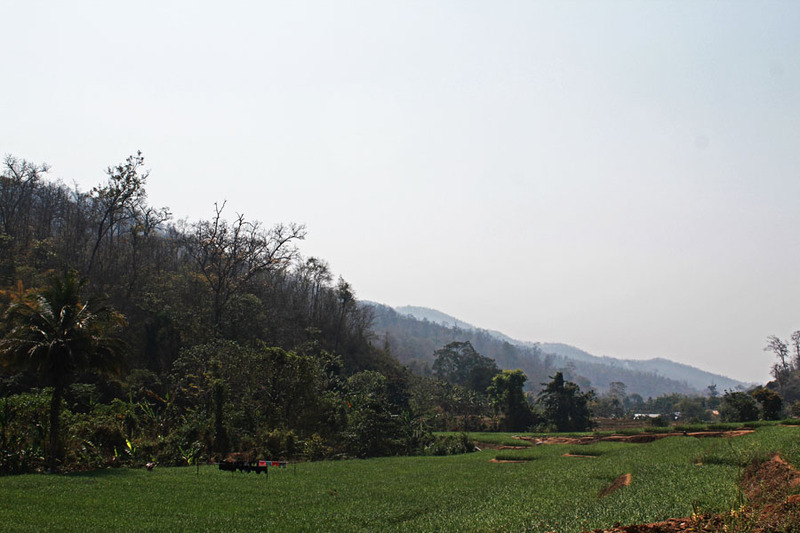 Here’s an article about riding the whole Mae Hong Son loop. Whoever is not too afraid of riding a motorcycle should definitely put this journey on their bucket list! There are maps to be found in bookshops, or sometimes even come along with the rented bike in Chiang Mai, but using Google Maps with a Thai sim card is also possible. Doing the loop with a scooter is also doable but takes way longer, get at least 125 ccm and consider maybe shortening the route. … oh screw the dull words, it was plainly life changing. What was your most remarkable moment in Thailand? I really enjoyed this article about Thailand. I especially liked that you talked about northern Thailand, a place I’ve never been. I would really like to try elephant trekking with my kids when they get a little older. Maybe you’ll have a chance to do it on your next trip there. I’m sure it’s an amazing experience to do this together with your family. I think the area is amazing for a trip for all of you together, as infrastructure is good, but places are not flooded by tourism yet. I hope so too, thanks 🙂 Happy travels! I love Chang Mai. Its great that you founds a good couch surfer there. One thing I would recommend to do in Chang Mai is to be massaged by the blind. It was the most amazing experience. 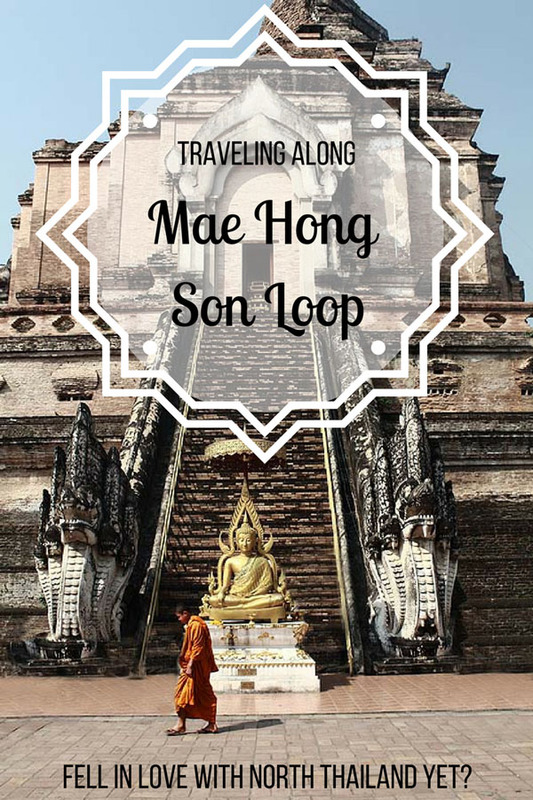 I will definitely look into doing the Mae Son Loop when I am next in that area. Looks like a wonderful trip. Thanks you for sharing! I loved this post. 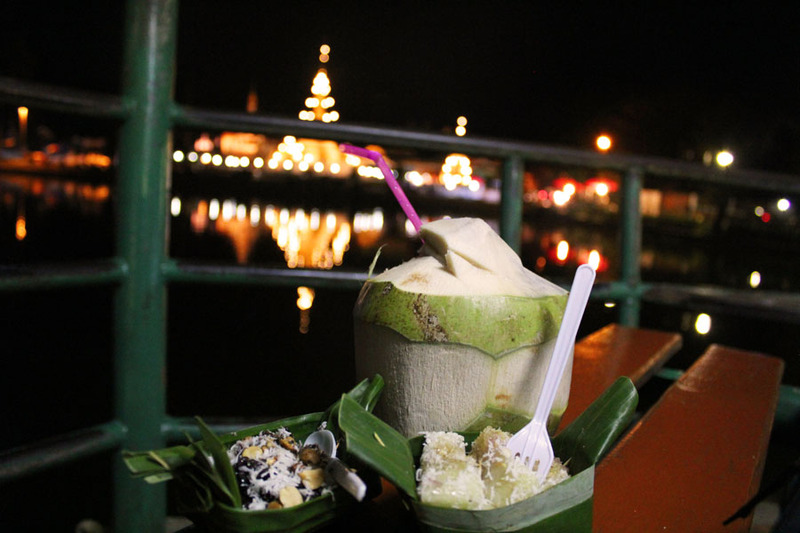 There are so many posts on Thailand, bur your post gives a refreshingly fresh and different perspective of Thailand. The way you have presented Chiang Mai is also lovely. Thanks a bunch! It makes me really happy to see my journeys provide actual benefit for others, too! Talking to a monk is something I would like to do myself. I like interacting with locals. Thailand has so much to offer! You’ll find secluded and authentic places anywhere I’m sure, but I can definitely recommend going up north once 🙂 Happy traveling! Sounds like such an awesome trip! I am missing Thailand quite a bit right now. I spent a few weeks there but didnt go North past Bangkok. I wanted to be near the water so I spent a lot of time down south, haha. Your pictures are awesome, looking to read more from you! I recently returned from Chang Mai and LOVED it! It was my favourite place I visited in Thailand. I was able to volunteer at an elephant sanctuary (I highly recommend this to anyone and everyone!) but was not fortunate enough to do the Mae Hong Son Loop. I definitely intend on returning to Northern Thailand so I will add it to my ever-growing list! Wow Sharleen, thanks so much for that wonderful comment! Sheesh I’m blushing! Makes my day 🙂 Hey, I couchsurfed quite a lot in very different countries, just drop me a line if I can be of any help! It looks like you got super lucky with your couchsurfind host! 🙂 I really enjoyed reading your post, we were travelling through the north of Thailand last month and we loved it! Chiang Mai was really crowded but we still managed to enjoy it. Keep up the good work ! Thanks heaps Laura 🙂 Glad you loved it as well. Must say that Northern Thailand, and the places off the beaten path, has been one of my alltime favorite destinations 🙂 Happy traveling! Beautiful photos! I used to live in Thailand for a little while and Chiangmai is my favorite city. It’s just so laid back and relaxing. I miss it now that I’ve moved away. How long are you going to be in Thailand for? Thanks heaps 🙂 Happy you could relate to my experiences, I also (obviously) loved it a lot up there. I traveled Thailand for a month in February this year though. Plan to be back eventually, but who knows when…. Will you be going back soon? Where are you living now?